So what’s this, Mr. Dizon? Why were you with these detractors if you have nothing to do with them? You say you have nothing to do with Jun Samson. 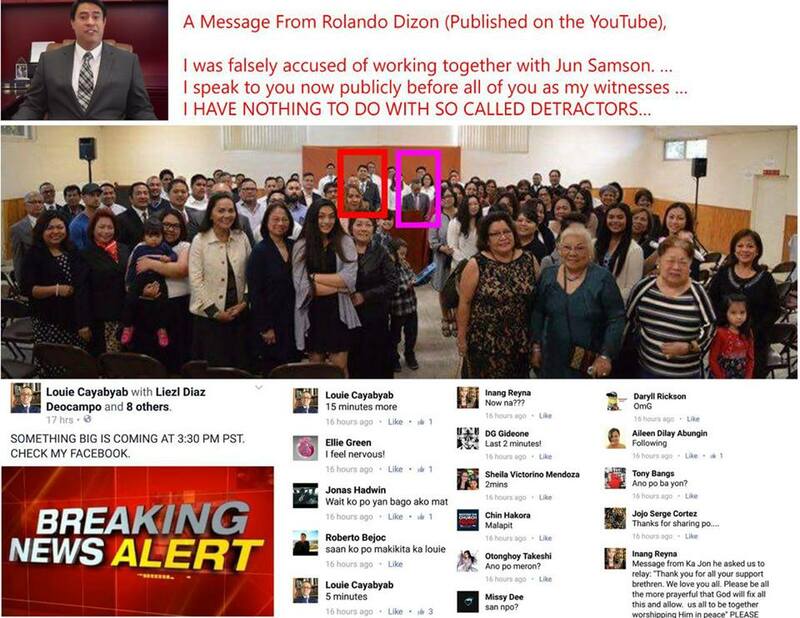 You even admitted that Jun Samson is an enemy of the Church. You said, “Yes, he’s an enemy of the Church, I know that.” But why is it that you’re with the same rebel group as that of Jun Samson? Perhaps you might reason out that this picture only reveals that you’re with Mr. Heart of Hearts, Luisito Cayabyab, and the other “INC Defenders” or should I say, INC detractors? But isn’t it that Luisito Cayabyab and Isaias Samson, Jr. belong to the same group of INC detractors? Or could it be that these two have already gone separate ways and you chose to side with Louie Cayabyab rather than Jun Samson? This picture speaks louder than your words, Mr. Dizon. It explains why Louie Cayabyab was able to announce ahead of time that something big was coming and that a countdown was even given by him to elicit an aura of suspense from his FB followers. This reveals that you were in contact with Louie Cayabyab before you published the video. By the way, wasn’t he the one who prepared the script that you read? It looks like a sequel to Mr. Heart of Hearts’ drama which was also uploaded on YouTube last year. 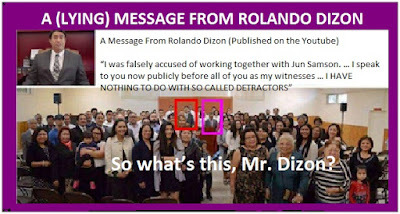 So what now, Mr. Dizon? 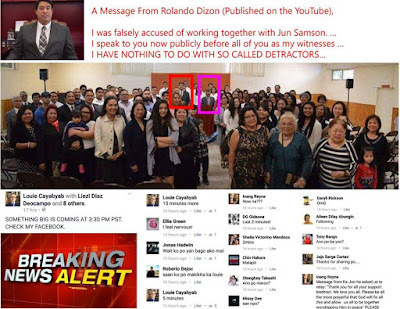 Per your admission, Jun Samson is an enemy of the Church. What about Louie Cayabyab? Is he not also an enemy of the Church and, in fact, fighting for the same (personal) cause as Samson? Did you think you can hide your treachery? Did you think you can cover up your real colors by appealing to sympathy and by trying hard to sound like you’re crying, while repeating the same words—like “I love you”—as you try to convince Church members to side against the Church and lose their salvation? Kawawa naman di ka na maliligtas..